“Where are you going?” This is the question that, every year, more than 100 high-school-aged young men grapple with at the Quo Vadis Philadelphia retreat, taking place at Black Rock Retreat Center in Quarryville, Pa. This year a new group of young men, accompanied by priests and seminarians from St. Charles Borromeo Seminary, will continue the tradition for four days June 25-28. They will enjoy fun activities, games, enlightening talks and time for prayer. In response to the core question of the Latin phrase quo vadis – where each of us is going in life – the Vocation Office for the Diocesan Priesthood organizes the retreat. Through activity and engagement, Vocation Director Father Stephen DeLacy and the seminarians help participants explore a possible call to the priesthood. Nevertheless, the retreat offers a wide variety of resources and experiences to help the young men seriously consider that question and prayerfully begin discerning their vocation. Attendee Dan Monastra believes Quo Vadis is retreat “where young Catholic men can go and just figure out what God wants them to do with their life.” Some of the most helpful elements of the retreat, he said, are daily Mass, eucharistic adoration, Liturgy of the Hours, rosaries and vocational talks. Quo Vadis has a real impact on the faith life of all who attend. Now in its 10th year, approximately 10 seminarians and former seminarians have attended the camp. One of them is seminarian and newly ordained transitional Deacon Alex Pancoast, who has attended every Quo Vadis since 2009, first as a student and then as a seminarian. Since his diaconate ordination May 13, he is on course to be ordained a priest next year. Quo Vadis also provides time to unwind and enjoy the beautiful setting of Black Rock Retreat amid the summer air. Some of the fun activities include the field games of the “Quo Vadis Olympics,” glow dodgeball, sand volleyball, pool and lake games, basketball, soccer, ultimate Frisbee, a ropes course and a bonfire with s’mores. Aside from spiritual and social sustenance, Quo Vadis ensures that all attendees are treated to delicious and abundant food. 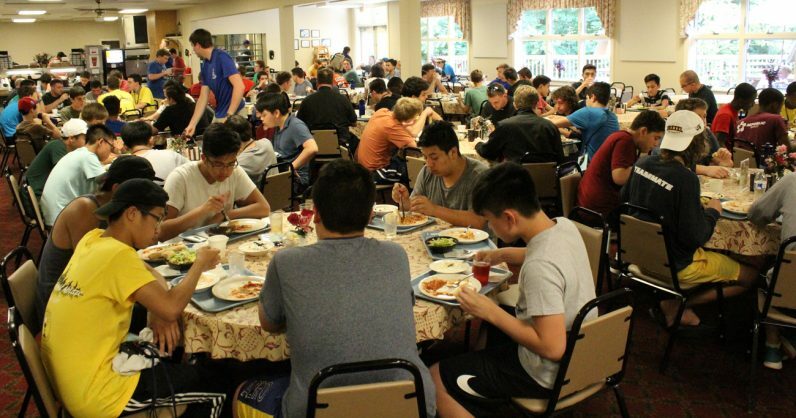 Through the variety of its activities, the retreat fills the need for faithful families that want something wholesome, inspiring and social for their high school boys. The social aspect is a key draw for many, and the friendships formed and reinforced there can last a lifetime. Thanks to generous support by donors, the price for attending the retreat is set on a sliding scale from $25-300, and families are asked to pay as they are able. To register by the June 4 deadline, visit the Quo Vadis website or call the Vocation Office at 610-667-5788. For a vocation survey and other resources to help a young man discern his vocation, visit the Vocations Office website, HeedtheCall.org.